My 2005 Desert Southwest Vacation - 17 days, 5960 miles. Days 1 to 5, Home to Tombstone, AZ. When: September 6 to 22, 2005. I hadn't done a real long road trip out West since 2001, and it was time to erase the bad taste of that trip. It was also time to do something other than the I-64 to I-24 to I-75 to Central Florida trips. I had two Road Trips I wanted to take. The first took a Northern route which went through deserts and then rain forests; and the second was a Southern route, which would take me through deserts, and then more deserts. The first trip would primarily be to follow The Corps Of Discovery's route. I was reading Undaunted Courage by Steven Ambrose, and it was also the bicentennial of Lewis & Clark's epic journey West to the Pacific Ocean. Everything was being spiffied up and polished for the anniversary. The second trip would be to some places I've always wanted to visit, but were just too damn far away. Tombstone, Disneyland (who was celebrating its 50th anniversary), Death Valley and Yosemite. What to do, what to do. Lewis & Clark's bicentennial would last three years, since their mode of travel was a little slow. On the other hand, how often would Disneyland have a 50th Anniversary? As a fan, it only seemed appropriate that a visit happen that year. Heh. I'd never been to the American Deserts of the Southwest, and they were high on my list of things to see. Another big draw was Tombstone, a place I wanted to see after reading several books on Wyatt Earp, Doc Holliday and the town itself. (And Tombstone was a better movie than Wyatt Earp. Nyah, nyah, nyah.) Add in the lowest point in the Western Hemisphere, and one of the most iconic spots in the Sierra Nevada Mountains, and my Desert Southwest Vacation was on the agenda. 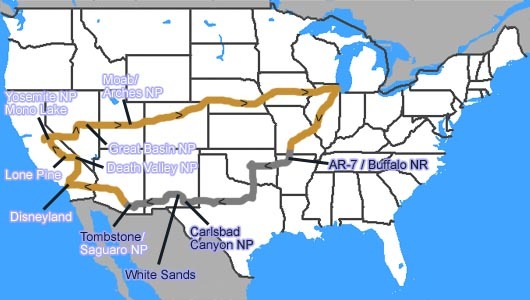 The route I planned would take us through the four major Southwestern deserts, with the primary stops mentioned above. Also along the way would be Carlsbad Caverns, White Sands, Saguaro National Park, The Owens Valley, Mono Lake, Great Basin and Arches. Since I didn't quite know what conditions were like in any of the places I was going, and knowing the scarcity of hotel rooms in tourist areas, I made hard reservations in several places from Tombstone to Moab. By June, the entire trip had been planned. Jo made some excuse, and I would meet her in Dallas/Ft. Worth. I was ready to go. I actually left on September 6, but took no pictures. I stayed in a Comfort Inn in Springfield, Missouri on the first night. Only about 520 miles, but any further would put me into the clutches of Branson, Missouri. However, having no reservations, if Branson couldn't provide a room, I didn't know how far it could be before I ran into another hotel. I left early the next morning, and headed South on US-65 toward Harrison, Arkansas, where US-65 intersects with Arkansas Scenic Route 7. I've had Scenic 7 in my top 10 drives ever since I first drove it in 1987. It's changed a lot, but the heart of it that goes through the Ozarks is as much fun to drive as it was back then. My initial plan was to drive down to I-30 or maybe even I-20 then to Dallas/Ft. Worth, but just before my vacation Katrina hit Louisiana, Alabama and Mississippi. News of gas shortages and refugees made me reroute via I-40 to Oklahoma City, then take I-35 South into Dallas/Ft. Worth. Well, not only didn't I take that many pictures, but I didn't take that much video. So the pictorial pretty much jumps from Arkansas to Carlsbad Caverns, New Mexico. One notable picture is the very first one. I pulled off into a slightly weed overgrown pulloff to get a bottle of water from the cooler, and there was a monument to the fact that the marble block from Arkansas in the Washington Monument was taken from that hill. I'm not sure I could find it again. Giant and Twin Domes. Carlsbad Caverns National Park. Sometime in the morning on Day 4, we passed that imaginary line from the rolling hills of Texas into the Chihuahuan Desert, the largest desert in North America, but not the largest in the US. It covers some 200,000 square miles, and gets around 10" of rain per year. Carlsbad Caverns National Park is at the Northern end of the Chihuahuan Desert, in the Guadalupe Mountain Range. I had my first real experience with the *desert* here, the seemingly vast empty wastelands of the West. 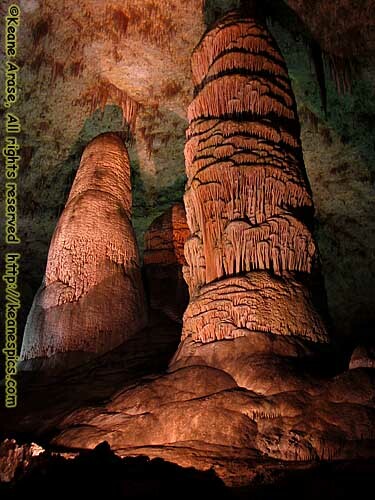 Carlsbad Caverns is another of those "Wow" places that start with an elevator ride. Down. 754 feet down. 250 million years ago, this area used to be a reef at the bottom of a vast inland sea. After the uplift of the earth, this reef was exposed. Rain water acidified with carbon dioxide slowly eroded the limestone, creating the caverns. It is another world in the cave. It's hard to describe, perhaps it the complete lack of sound, except for the other tourists, of course. There's no wind or breeze, it's completely still. Everything is artificially lit, it feels more like Disney World at night. It's more humid than the desert outside. And other than the guardrails, there are no straight lines. The cave just happens to be in the desert. Above, you can do the 9.5 mile Walnut Creek Desert Drive, my first introduction to the Southwestern Deserts. It's arid, and only the most hardy vegetation survives, but this area has been inhabited for over 10,000 years. Americans have homesteaded here since 1890. The park used to be a goat farm. Another interesting visitor attraction here is the Bat Flight. Every night at sunset, almost a half-million Mexican Free-tailed bats depart the cave to feed near the Black and Pecos rivers that flow several hours to the East. It was this mass exodus of the bats every night that alerted the early settlers to the cave. The night was spent at a Comfort Inn in Carlsbad. From Carlsbad, we took US-285 to US-82 toward Alamogordo, then to US-70 to White Sands National Monument. As I came up over the Sacramento Mountains, and looked down into the Tularosa Basin, I saw something I'd see over and over this trip. A basin. A basin is is a valley not carved out by glaciers or water, but by a geologic event. It's essentially a valley where there is no water outlet. The forces that created the valley were essentially the same that formed Carlsbad Caverns. Then, a giant dome formed during the Colorado uplift, then subsequently collapsed about 10 million years ago, forming the Tularosa Basin. The White Sands Missile Range is here. From around World War II, the military would fire off captured missiles from someplace in Utah, and they would land in this area. They still do that sort of testing, and the White Sands National Monument (which is right in the center of the range) can be closed for up to two hours at a time. The White Sands National Monument holds most of the largest gypsum dune field in the world. (Transformers 1 & 2 were filmed in the dune field, but not in the National Monument.) Now when they call this place White Sands, they're not kidding. Gypsum would normally be water soluble and flow out of the valley, but since there is no exit for water to go from the basin, the gypsum concentrates here. With the intense New Mexico sun, it makes for a blinding, snow white sand, and in the middle of the dune field, it seems to stretch as far as you can see. Once out of the car, I found myself squinting even with my sunglasses on. It could also give you sunburns where you normally wouldn't think you'd get a sunburn. But I digress. We walked the Interdune Boardwalk Trail, a handicapped accessible trail. In a greenie friendly way, they made the boardwalk from recycled plastic bottles and aluminum. Well, in the dry, windy climate, the plastic generates static electricity. I swear my foot was four inches above one of the aluminum strips, and you could hear the 'snap' of the spark jump from the boardwalk through my shoe. You could feel the hair on your arm start to stand up as you approached a metal beam. Stupidity in the name of recycling. But I digress. Again. Tombstone is about 25 miles north of the Mexican border, and was established after silver was found in the area. It was a mining boomtown that was made legendary by three brothers named Earp and dentist from Georgia named Holiday. Like much of the old west, fires took its toll on Tombstone. Many of the original buildings are gone, but there's been some effort to keep the legend alive. The Birdcage Theater is actually supposed to be original. It's now a "museum", but I thought it was very, very cool to walk through buildings that actually existed from that infamous time. The courthouse is original and restored, and has some interesting documents from those interesting times. And yes, I know it's a giant tourist trap. So what's your point? End 2001 West Vacation - Part 1 of 3.